Previously: Austin Aries defeated Grand Champion Matt Sydal to win the championship. 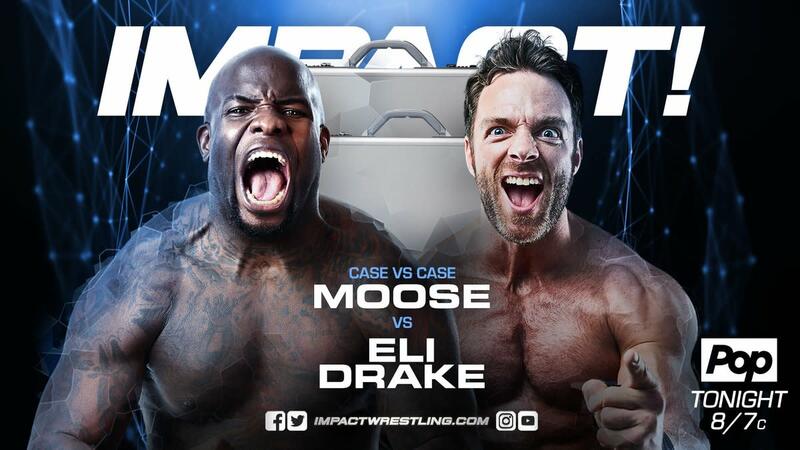 Tonight: Moose takes on Eli Drake with both the World Championship and Tag Team title shot briefcases on the line. - Bobby Lashley came down to the ring and called out Brian Cage. Cage entered and, as he posed on the apron, Lashley jumped him from behind. Their brief brawl suddenly turned into a match. Lashley was firmly in control after kicking Cage low, but Cage fired back by hitting a German suplex and a Death Valley Driver for a near fall. Cage executed a massive deadlift superplex for a two count. Cage missed a discus lariat and Lashley hit the spear for a near fall. Cage used a jumping knee and the Drill Claw for the win. - A fired up Allie came down to the ring and called out Su Yung. As Yung posed on the apron, Allie jumped her from behind. Allie had the early advantage until Yung quickly took over. Yung scored a near fall after hitting a hanging pedigree. She tried to use a kendo stick, but Allie caught her with a superkick. Braxton Sutter ran down and distracted Allie, with Yung attacking Allie and the referee with the kendo stick. - KM tricked Richard Justice to go to the ring. KM bullied Justice for his appearance, telling a series of fat jokes. KM jumped him until Fallah Bahh ran out for the save. Trevor Lee and Caleb Konley then came out to give the heels the advantage, but Tyrus appeared and cleared the ring of the heels. They went back and forth early with neither guy getting the upper hand. Ishimori sent Impact to the floor and followed up with the Golden moonsault. Impact landed a standing Shooting Star Press for a near fall. Ishimori used a huge hurricanrana for a very close two count. Impact made a comeback and hit the Starship Pain for the win. After the match, Jimmy Jacobs and Kongo Kong entered to confront Impact. Kong gave him a vicious beatdown. Impact made his own comeback and took out Kong with a dive to the floor. - An in-depth video on Austin Aries vs. Alberto El Patron aired. It covered their careers in Impact and the many ups and downs they've had. El Patron briefly discussed his personal problems. Lethal had the brief advantage, but Angle took over after a buckle bomb. Lethal made a comeback and scored a near fall with an enzuigiri. Lethal hit the Randy Savage elbow for another near fall. The finish came when Lethal countered the ankle lock into a pin for the victory. Moose had the edge as they brawled around ringside, but Drake took over after he sent Moose into the ring post. Moose came back with a buckle bomb and hesitation dropkick. Moose attempted the Game Changer, but Drake ducked and Moose nailed the referee. OVE ran out and attacked Moose until Eddie Edwards made the save. Drake used Sami Callihan's baseball bat, only getting a two count. The finish came when Drake hit the Gravy Train on Moose to win the World Championship briefcase. Drake now has both a World Championship title shot and a Tag Team title shot. Next Week: Rosemary takes on Taya Valkyrie in a Demon’s Dance match. Also, Josh Mathews goes one-on-one with Petey Williams. Austin Aries & Fenix vs. Alberto El Patron & Pentagon Jr.